If you shouldn’t fall in love with a book by its cover . . . how about its end pages? Because these are truly stunning! The front pages feature all of the animals you might find above the ice in Antarctica and the final end pages reveal many of the creatures who live below the Antarctic waters. Wander (or waddle) through the day of an Adélie penguin chick in her Antarctic home. Through the story of her day we are introduced to elements of the Antarctic landscape, penguin habits, their predators and the creatures who share their home. 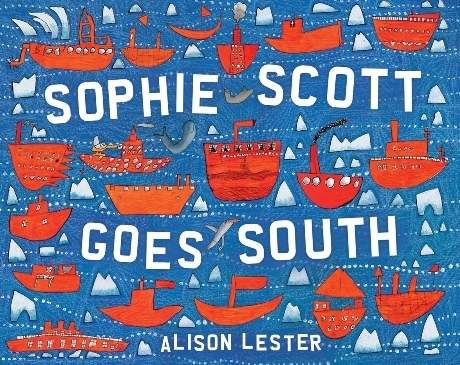 Perfect for younger listeners, this is a beautiful read aloud to introduce children to the continent of Antarctica and it is sure to spark further reading and research. This would also be a wonderful mentor text for older readers to share their research on an animal as a “day in the life” format. This book begs you to consider art projects. It is stunning on every page. Like all Flying Eye Books, the pages are high quality and the colour palette, so attractive. 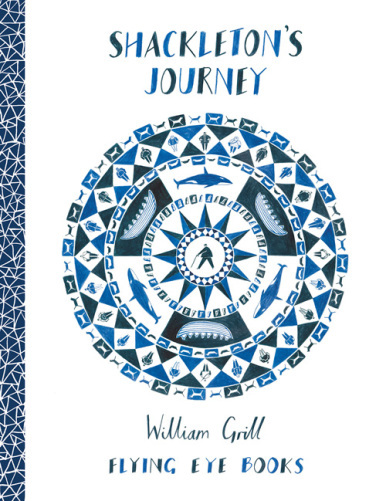 Shackleton’s Journey by William Grill, a stunning Flying Eye book published in 2014. This entry was posted in Non-fiction, Nonfiction Picture Book Wednesday and tagged #NFPB2016, Alison Lester, Ella Bailey, Flying Eye Books, nonfiction, William Grill by carriegelson. Bookmark the permalink. I’m really excited to get my hands on the Shackleton one! Thanks for sharing these recommendations! One Day On Our Blue Planet sounds good, Carrie, for the granddaughters! I know the other two, loved Sophie Scott, am fascinated by the Shackleton story, have read the adult books, & this one is wonderful, too. Thanks! I think your grand girls would love it Linda! I love penguin stories, but haven’t read this one, thanks for spotlighting it! I always like when bloggers show other books that go with the book that is being spotlighted. Very helpful! I think you will enjoy this one Michele. It is lovely for younger students. Such lovely books! I have read several books on the Shackleton expedition, I would be very curious to see a children’s adaptation – it is such a thrilling story! This Flying Eye title by William Grill is incredible! What a great thematic collection as the sleet continues to fall here in the north! Oh dear! We are fully into spring here in Vancouver. This book seems fantastic. Thanks for sharing it. I haven’t even read the books you suggested readers pair with it. I am behind on my Antarctica knowledge, and now I feel like I need to catch up. Thanks for giving me a place to start! My pleasure. I highly recommend each of these titles. I’ve had my eye on One Day on Our Blue Planet…in the Antarctic for quite some time. I think there are others in the series. I think I have to have it now. And of course I adore Grill’s book. I think there is one other in the series. I am also thinking I might need to have the collection and hope it grows! I’ve read Sophie’s story, but not the other two. I am fascinated by Shackleton, and I didn’t know about this one. I also love penguins, so I need to check out One Day.